I have to admit, I have been rather fascinated with making candy lately. It started a while ago, but any chance I get, I seem to be making more candy. First of all, everything I have made so far has been super easy, if you know how to use a candy maker. 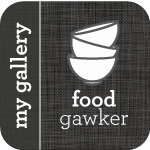 Which reminds me…I remember years ago – I was deathly afraid of using a candy thermometer. If I came upon a recipe that called for one – I would just skip it. I didn’t own a candy thermometer, and had no desire to. I was in serious denial. I am not sure when I actually broke down and bought one, somehow I have blocked that out of my memory – but all of a sudden I ran out of excuses. I knew that I couldn’t put it off any longer, I had to start using the candy thermometer. One of the first really successful candies I made were these…and boy did these give me the bug. Now, I look for reasons to make candy. Mostly I have been focused on the hard candy – aside from those caramels. I can’t wait until I have some time (someday), and I can start making things out of this cookbook that I got a few months back. Everything looks so darn good. I saw this recipe in Cooking Light (yes, I know, seriously??) and couldn’t wait to give it a try. I finally made it to go with a special tart – just to put it over the top – which hopefully it did. I know that these candies were to die for. I was eating the scraps, and I almost didn’t want to call the girls down to share – yes, these were that good. They were not to hard, but just perfectly crisp – with that nice thick layer of chocolate, and then the slivered almonds. My mouth is watering now. Good thing I was making these for an event, or I would have eaten the entire batch. Sometimes it is good to do something that scares you – I take that back – it is always good to do something that scares you – just like change, it helps you to grow. So, why not do something that scares you – and end up with this in the end? Come on…I dare you. Combine first 3 ingredients in a small, heavy saucepan over medium-high heat, stirring just until combined; bring to a boil. Cook, without stirring, until a candy thermometer registers 325° or until syrup begins to caramelize. Stir in vanilla and salt. Working carefully and quickly, pour sugar mixture onto a baking sheet covered with parchment paper; spread to desired thickness. Let toffee stand 5 minutes. Sprinkle chocolate over warm toffee; let stand 5 minutes. 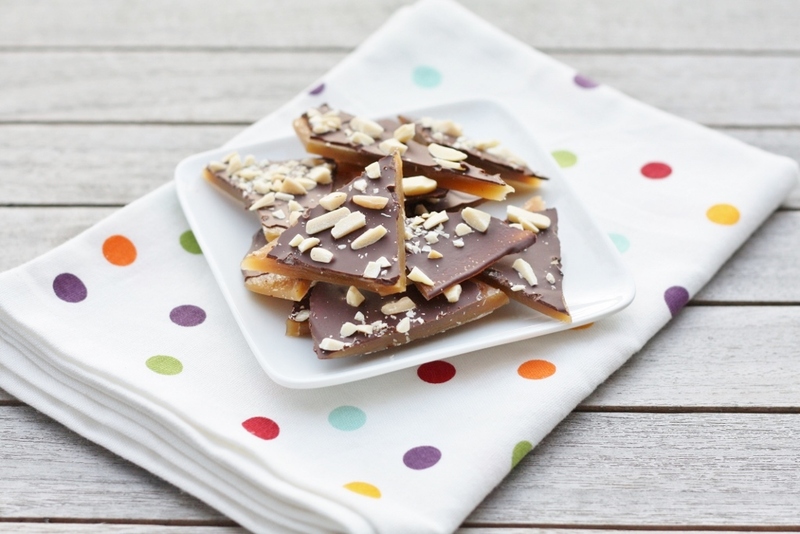 Spread melted chocolate in a thin, even layer over toffee; immediately sprinkle with chopped or slivered almonds. Let stand 1 hour or until completely cool. Break toffee into pieces. I am all for making more cake! Ok that it, my teenagers are moving in with you.They ask me everyday, Mom why don’t you cook like her? She does not make your kids eat vegetables and they get treats every day…..